Roxane and Troy in the middle of the parenting years of young children, out on an anniversary date. Later today, on this Valentine’s Day 2019, my husband and I will enjoy lunch together, then head to an appointment to discuss a possible second open-heart surgery for him in the course of just over a year. His first and very unexpected procedure, preceded by virtually no symptoms (the need for which was discovered after a routine walk-in doctor visit to deal with a nagging fever) happened on Dec. 6, 2017. Given today’s appointment, you might say we’re taking “Heart Day” literally this year, for, rather than a day of romantic gestures, we will be getting to the heart of things regarding my beloved’s health, and the recent discovery that something is still very wrong with his heart. Not only another valve leak, but a new development — hemolytic anemia — which complicates things further. Back when we said “I do,” and promised the gift of ourselves to each other “in sickness and in health,” we couldn’t have imagined this, but here we are, and despite great consternation over the state of things, we are being held as steady as can be expected through our faith. 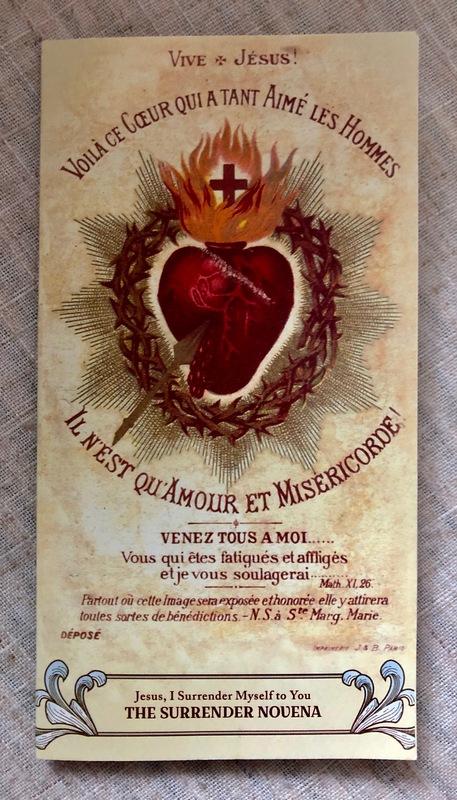 The novena we’re doing together, the surrender novena, literally has the picture of a heart (the Sacred Heart of Jesus, which burns with love for all of humanity) on the cover. And small, recently-acquired statues of the Sacred Heart of Jesus , along with the Immaculate Heart of Mary, now watch over us as we sleep. Valentine’s Day comes with baggage, does it not? To many, it’s a commercialized annoyance. To others, a reminder of the love they don’t feel. I have felt those things at different times myself, but this year, it’s all coming into perspective for me. “What’s love but a second-hand emotion?” Tina asked in 1984. All these years later, I’d agree that love comes second, after “decision.” Long after the butterflies flutter away, we are left with real life. And speaking from real-life, personal experience, we are left with this: a life and death moment, which has caused much reflection, and so much appreciation for our marriage, along with the realization that, despite so many rough moments and uncertainties, we’ve been held together, by little more than the grace of God. Further introspection on the topic comes from a friend, who shared some thoughts on a private Facebook page we’re both connected with to encourage couples struggling in their marriages — and I will assure you, we face some extraordinary stories of heartache on that page. One of the members who is struggling this year asked others in hurting marriages advice on how to embrace Valentine’s Day given these sufferings. My friend’s wisdom, from her own great losses in love and marriage, really spoke to me, and I’m sure others, and I wanted to share them with you today. “Valentine’s Day 2009 my husband and I renewed our vows with other at Mass on one of my happiest days ever. That Mother’s Day he left out of the blue. Valentine’s Day 2012, our divorce was finalized, stamped with the date forever. “Yes, I understand struggling on special days. I have a few crazy ‘coincidences’ like this. I don’t understand why God allows these things, but I do know Valentine’s Day is not about the Hallmark, chocolate candy, over-priced bouquet fluff we think it is. Valentine’s Day is about choosing to love another despite his or her ‘worthiness.’ It is about choosing to love God above all and to selflessly serve Him even when it’s hard, even when it means loving without evidence of being loved in return. It’s about a Cross rather than a heart and a commitment rather than a condition, a decision rather than an emotion, and a covenant rather than a contract. It’s about knowing that even in divorce your call to Love is unchanged while the burden of doing so is not easier. It’s about choosing the same attitude and sacrifices that many of our Saints did and hoping to one day also be made a Saint. It’s not about one day. It’s not even about your spouse’s life. It’s about one life: yours. It may be hard to hear, but it also can be the most freeing thing you will ever learn in this life. True love is welcoming another child into your family’s fold. 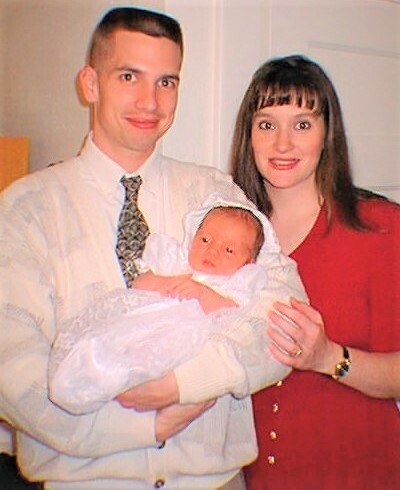 Troy and Roxane on Oct. 19, 1997, the Baptism Day of their second child, Olivia Marie. God bless you, and Happy Valentine’s Day! Q4U: What does Valentine’s Day mean to you? Thinking of you. Sending heartfelt good wishes.